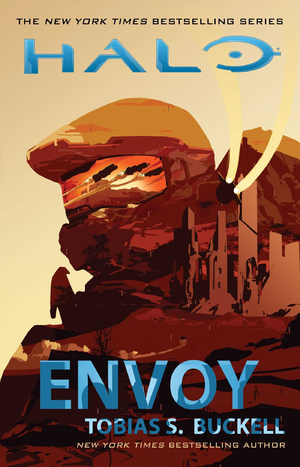 Halo: Envoy is a novel set in the Halo universe by Tobias S. Buckell. It was released on April 25, 2017. The Halo: Fractures short story Oasis, also written by Buckell, served as a quasi-prequel to Envoy, introducing the novel's central setting and conflict. “ It has been six years since the end of the Covenant War...and yet on the planet Carrow, a world on the edge of the Joint Occupation Zone (JOZ), a decisive new battle suddenly erupts. Human colonists and the alien Sangheili have already been living a tension-filled co-existence in this place, with Unified Earth Government envoy Melody Azikiwe attempting to broker a lasting peace between their two species. But as civil war now engulfs the Sangheili settlers, Melody must act on an additional covert assignment courtesy of the Office of Naval Intelligence: find a way to free the SPARTAN-IIs known as Gray Team, held in stasis since the end of the war by a cunning Elite fleetmaster consumed with vengeance. And none can anticipate the ongoing violence leading to the discovery of an even greater, unstoppable threat, hidden for eons below the surface of the planet…. The novel's cover is illustrated by concept artist Chase Toole, who also designed the cover of Halo: Saint's Testimony and provided artwork for Halo Mythos. The novel includes a map, drawn and annotated by Sarah Campbell, which shows several key locations shown in the novel. The novel has several inconsistences with the number of enemy ships involved in the Battle of Carrow: when the Jiralhanae fleet is first mentioned, they are stated to have two ORS-class heavy cruisers and two CPV-class heavy destroyers. Shortly afterwards, the Foebane, one of the cruisers, departed for the planet's surface. After Thars 'Sarov confronted Hekabe and Hekabe ordered his ships to turn on Thars', two Jiralhanae cruisers were stated to be attacking despite the fact that there was only one cruiser left in orbit while Foebane dug up the Sharquoi hive. After the battle, Annexus states that they lost two of their ships, but while the third is presumably destroyed as well, it is never mentioned again nor is it seen being destroyed despite Foebane being stated to be the last Jiralhanae ship left at that point. On page 192, Governor Ellis Gass is told that the two Covenant frigates in orbit have retreated rather than face her merchant ship in the opening stages of Operation: BUZZHAWK. However, the two frigates are stated to be Jiralhanae frigates when previously up until that point they were identified as belonging to Thars and were thus Sangheili ships. Presumably, this was a simple error on the part of the author.